The EPIC H2k Edition gaming chair from noblechairs combines PU-leather and luxury design with the ergonomic sitting style of an office chair. As a gaming chair for enthusiasts, gamers and power users - this chair represents far more than a mere ergonomic racing-style office chair. For all those dyed-in-the-wool H2k fans this represents a true "must have"! The professional gaming organisation based in London has united a variety of eSport teams under their banner. Counting among these successful teams are their League of Legends (LoL) team, ranking in the top three best teams in the European LCS (as of 04/2017). Some of the greatest successes of H2k-gaming's LoL teams include reaching the semi-finals of the 2016 world championships - the only Western team present! The machine-only construction of noblechairs is only possible thanks to state of the art machinery that is capable of fusing premium materials with extreme precision manufacturing. The steel frames of these gaming chairs are welded by means of robotic arms, as one might expect to see on an automotive production line. This enables the creation of a flawless and extremely durable frame. The cutting of the upholstery is likewise carried out with the aid of extremely precise industrial cutting machines. The noblechairs EPIC is the Best Gaming Chair of 2017! 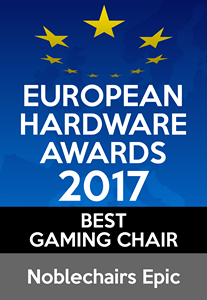 At Computex 2017 in Taipei (Taiwan) the European Hardware Association bestowed the noblechairs EPIC series the sought-after European Hardware Award 2017 in the "Best Gaming Chair" category, awarding them their well-earned crown for their superb series. The award and all other award winners can be viewed here (external link). Here at Overclockers we would like to extend our congratulations on their win! The noblechairs EPIC gaming chair, available here in the H2k Edition in black-blue with white stitching as well as the "H2k" logo of the renowned eSports team, is coated with a premium vegan PU-leather covering. The combination of breathable cold-foam and upholstery ensure you don't break a sweat amidst even the most heated battles. The white stitching on the seams and the backrest have been woven with the help of industrial stitching machine, offering an elegant addition to the black-blue PU-leather. A robust, oval-shaped aluminium badge with the white noblechairs logo is located at shoulder height and the stylish "H2k" logo on the headrest rounds out the design of this throne among gaming chairs. The upholstery of these noblechairs consists of a highly deformation-resistant 55% cold foam. The breathable cold foam enables superior airflow while maintaining shape stability. This enables the chair to maintain its shape over time while ensuring comfortable temperatures. Compared to other gaming chairs, an executive chair from noblechairs also contains a full steel frame. Apart from the increased breathability of noblechairs, they also offer a multitude of adjustability options that ensure that - once seated - you won't want to get up. As such the EPIC gaming chairs are height-adjustable by up to 10 cm. In conjunction with the adjustable rocking mechanism that enables the whole backrest to be adjusted to that ergonomics are no barrier to your gaming enjoyment. The 4D armrests of noblechairs can be adjusted in four dimensions to enable every user to find the perfect seating position. The high backrest meanwhile can be adjusted by up to 135° and, in a final flourish, the small neck- and lumbar cushions can also be adjusted according to your preference thanks to the attached elastic bands. The base of the gaming chair from noblechairs is formed by a powder coated, five-point, solid aluminium base with special castors. These 60 mm castors consist of a nylon core with a polyurethane coating, this makes them both quiet as well as ideal for hard and soft flooring. The Safety Class 4 gas lift supports a load of up to 180 kg. Add to Your Throne with Premium noblechairs Accessories! These luxury chairs from noblechairs deliver, without a doubt, a superb sitting experience straight out of the box, and the only thing that could make it any better are some choice accessories from noblechairs themselves. In order to customise the chair to the exact requirements of the user, noblechairs also offers practical 60 mm hard-floor castors with automatic braking function, which makes any slipping of the chair forwards or backwards while in use a thing of the past. The shorter gas lifts offer a reduced total height for the seat, thereby making the EPIC series the perfect throne for smaller users. The professionals at gaming-stuhl.de took the noblechairs EPIC Real Leather Gaming Chair for an extensive test drive. Initial impressions in respect to the construction, comfort, and adjustability as well as the advantages and disadvantages of real leather, can only be described in glowing terms. 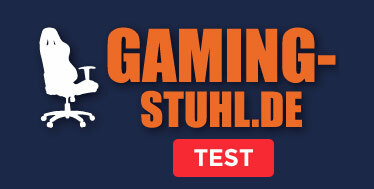 The full review is available at Gaming-Stuhl.de here (external link). "The noblechairs EPIC Real Leather Gaming Chair actually deserves 6 stars: This epic and innovative product sets new standards in terms of design, manufacturing and material quality. This is, in every respect, a luxury product where the term "premium" does not do it justice. Recommended!" More links for "EPIC Gaming Chair - H2k Edition - Black/Blue/White"